I used to live in a coastal city and enjoyed going down to the harbour watching the ships and subs coming and going. Let's all post pics of any subs that we have in our collections. The following 1979 Canadian stamp (Scott # 846) shows a Consolidated Canso attacking a surfaced U-Boat. The following 1992 Canadian stamp (Scott # 1451) depicts U-Boats off the east coast of Canada during the darkest days of the war (1942) attacking convoys. The following 1993 Canadian stamp (Scott # 1505) depicts a Canadian corvette attacking a surfaced U-Boat. The following cover contains 1944 German stamps and the one at the lower left is Scott # B260 showing a submarine officer looking through the periscope. 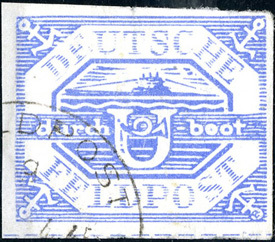 The next stamp was issued by Germany in 1943 and is Scott # B218. The following US stamp is Scott #1128 issued in 1959. It shows the submarine "Nautilus" under the polar ice. Is that a yellow submarine ?! !